There's no point having strict plans for the sewing queue I've decided, they never work out. 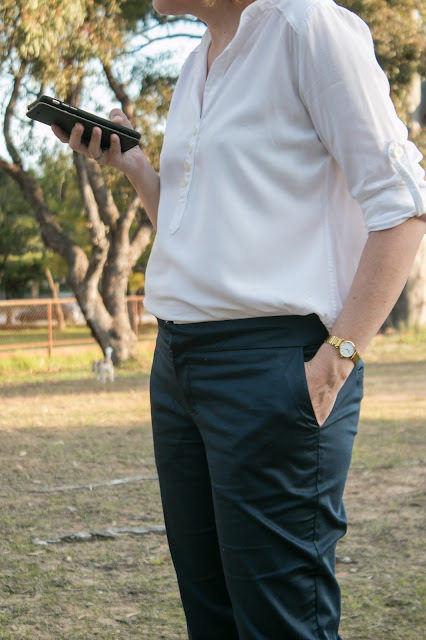 I have had a vague plan in my head to try and make slim legged work trousers for at least the last two years, using the pattern from my TAFE class a couple of years ago. But I never have, mainly because I knew it would be a lot of work to adjust the leg shape to get it the way I wanted it, and because I knew proper work trousers would need hip pockets at the front and welt pockets at the back, and my original pattern has neither, plus I needed to learn how to make welt pockets. 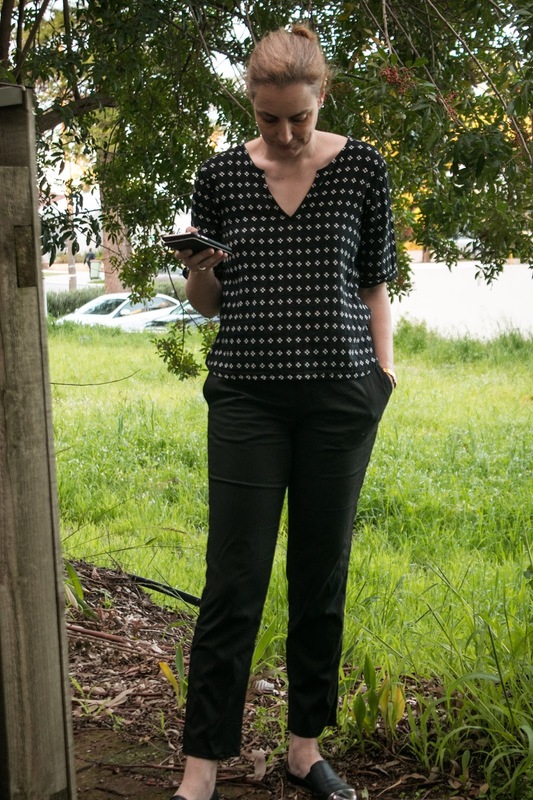 And then along came a tester call for the Itch-to-stitch North Point Trousers and I jumped at it. 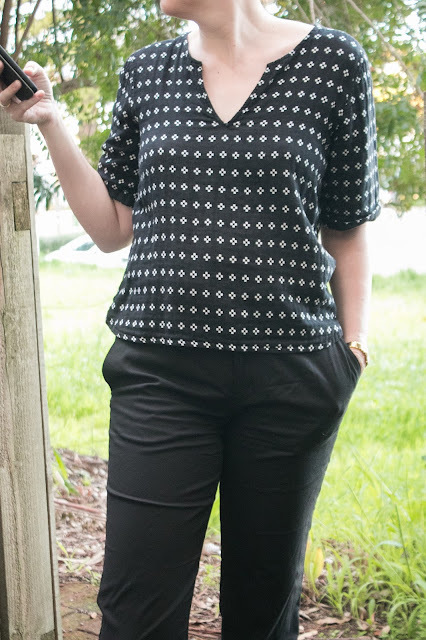 The pattern had so many things I like -- slim, but not skinny leg, the welt pockets, intended for stretch wovens (I've had a black piece of fabric in the stash for years waiting to become pants) and I've made several Itch to Stitch patterns up before and been happy with the instructions and the result. One of the things I really like is that the pdfs have layers, which meant you only have to print the size you are planning to cut out. Pattern designer Kennis asked the testers to make both a toile (in suitable stretch woven fabric) and a final pair, but because I really like the fabric I used for my toile I decided to make that pair wearable, although I omitted the welt pockets. I also have never been able to do a really good fit check without installing the fly zip, pinning just doesn't seem to show the true fit for me. It all went pretty well, I got both pairs completed in the 10 day time frame and I've already work them both to work several times. 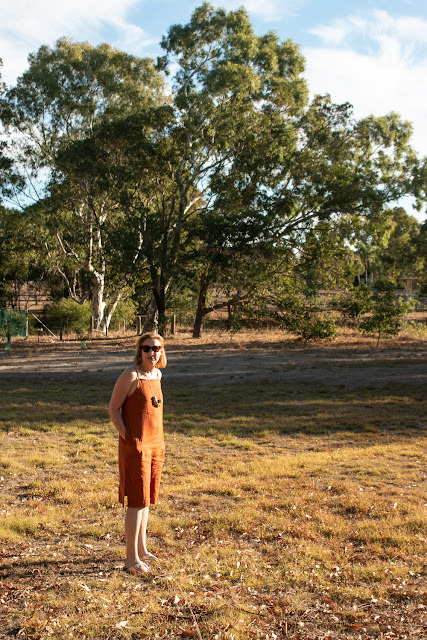 The wearable muslin, with the delightful waste ground next door to my place in the background. I love the wearable muslin pair more, just because the fabric is so soft and drapey. Present me is very pleased that past me recorded the exact details of what this fabric is -- apparently it's a cotton spandex blend but it really feels like it could be rayon. The stretch is very slight and the cloth is buttery soft. When I went shopping for fabric for the second pair stretch woven suiting seemed to be an unknown commodity in Perth. After searching at Potter textiles and Textiles Traders I ended up back at Spotlight and the only remotely suitable thing I could find was their cotton sateen, which has 4 per cent lycra and a bit of a sheen. The sateen pair. I've finally found an ok place to take pics outside without dying of embarrassment that I'm using a tripod to take selfies - it's a semi-abandoned primary school with a playing field that no one uses. The pattern fits pretty well out of the (virtual) envelope, I had to do my usual sway back adjustment taking a wedge out of the centre back but that was it. I also added two inches in length. 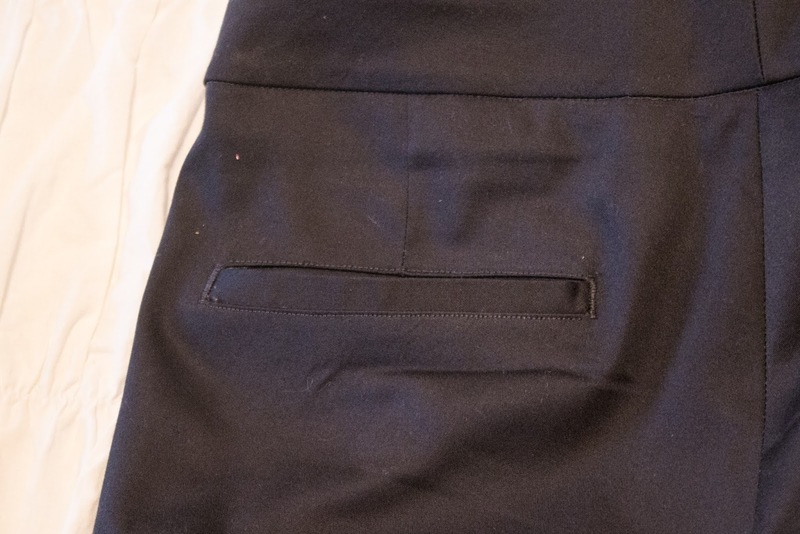 The pockets are constructed with the fabric overlapping and zigzagged inside, it confused me initially but gives a very flat finish at the front. 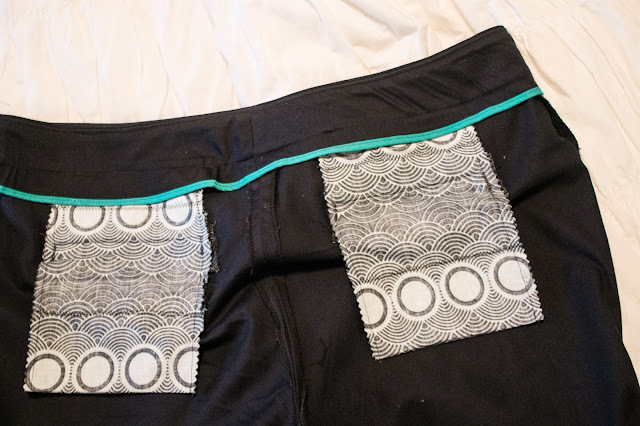 The welt pocket instructions are great and I'm really chuffed with how these turned out. 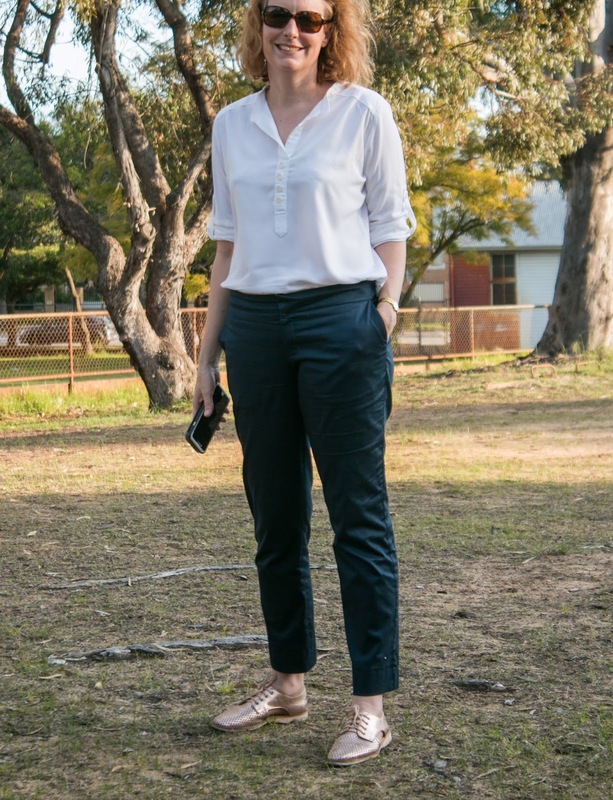 These are mid rise trousers and ideally I'd like them to be a bit higher-waisted. It's not a huge issue but it does mean I'm unlikely to wear these with a shirt tucked in, whereas if they were closer to my true waist I would. I'm not sure what the technical term for it is but the waistband gapes a little bit at the point where the hook and bar closure is. This is pretty common with me, it also happens with RTW trousers and I think it's just the nature of not having a perfectly flat tummy. When I did my sewing course at TAFE my teacher told me that that style didn't work for her either and she had us create a waistband where the tab extended further, pulling everything in a bit. Yes, absolutely, I've already got plans to graft the welt pockets onto another project as well. I'd also like to blend the elements I love, the leg shape, the pockets and the welts onto another higher waisted pattern I've already got. Yes, again and again. They are neutral, they are work appropriate, they have pockets and they are both very comfortable. Because they are black and navy they will work with so many tops and I think I'll have to remind myself to try other outfits for work. The pattern is now for sale here, It's on sale for $US9.60 for the first week and $US12 after that. See all the tester versions of the pattern here. Pocket linings are scraps from previous projects. Total spent: $55.78, not bad for two pairs of work trousers.